Shown in Praline Mist (G19+). 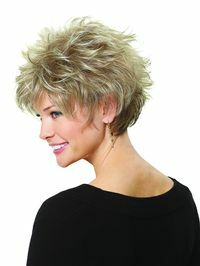 Short all over textured layers define this classic cut. Wear it spiky or smooth, the choice is up to you. Available in two cap sizes. 34C, 305C, 511C, G4+, G6+, G8+, G10+, G11+, G12+, G13+, G14+, G15+, G16+, G19+, G20+, G27+, G29+, G30+, G38+, G48+, G56+, G60+, G101+, G630+, G811+, G829+.